As you pass through Bonn on the train and look west you’ll see a hill with a big radio mast on top. That’s the Venusberg. Around that mast lies the Venusberg district and it’s populated by around 2200 people. The Venusberg postal area is only 4 square kilometers in size, has a few shops and is a gateway to the Kottenforst forest that stretches south and west. Oh, and there’s a University Hospital where 7000 people work and over 1000 patients can stay overnight. I live there and I can tell you we have a traffic problem that needs to be fixed..niversity clinic Bonn or UKB – Wikipedia) generates a lot of traffic from workers, patients, guests and service vehicles. The UKB is currently expanding which could lead to a 50% increase in motorised traffic within 10 years . I’ve lived on the Venusberg for over 10 years so naturally it impacts my life but as a biking fan, public transport fan and alternative energy fan I think about how some of these transport solutions could help Venusberg in the future. Not only could these solutions preserve the quality of living in this area but could also promote the use of the Kottenforst as a recreational facility, help people improve their health and nurture the use of electric vehicles. My action has been spurred by a recent residents initiative and a feasibility study into a urban gondola transport system. Note. This is not a scientific study or formal report, but informed opinion. See below for more on my background. I don’t believe a UN Campus – Venusberg gondola will help the Venusberg traffic situation significantly and it won’t be a significant route for tourists but I think a full cross-river gondola for Bonn will work as a much better solution in many ways. It could improve perception of public transport in Bonn. It will generate new ideas for tourism. It will improve commuter journeys in many cases. It will create an important east-west route and it seems achievable for Bonn. In order to reduce the traffic and parking issues on the Venusberg a series of measures need to be taken. E-bikes, improved public transport reliability and quality and more involvement, management and investment by the University Clinic are needed. This would help not only Venusberg but Ippendorf, Popplesdorf and other surrounding regions. Venusberg Problems now. Worse later. It’s not too noisy up here on the Venusberg. The big bendy buses can be heard for about 20 hours a day (about every 5 minutes one will pass within 50 meters of my house) but I can’t complain. Ambulances, occasional helicopters and heavy goods vehicles must be expected if you live near a hospital. I was in the hospital recently too so I’ve got a good perspective on it. One of the big problems that we need to tackle is traffic volume and related parking. Clear access up and down the Venusberg is a priority along with road safety and air quality. There are a few other, smaller, issues we have on Venusberg. One is the lack of east-west bus connectivity. There’s a route that serves the United Nations / Deutsche Welle / Post business area during peak times but if you want to get to the airport or get to the other side of the river it’s a complicated journey by public transport. There’s also a lack of residential shopping services here. All the cafes are oriented towards hospital staff as is the local “Tobacco Market” (can we get that name changed please?) post-office. The religious communities do a good job as meeting-points but there could be something more far-reaching and accessible for all. There’s little in the way of a community center, evening cafe or restaurant choice. After 6pm, Venusberg is dead. Top problem: Parking and traffic levels. Because Venusberg is on a hill it’s difficult to get up here on foot or by bike. You can get from Popplesdorf to Casselsruhe in 15 minutes by bike and 25 minutes by foot but it’s a slog. A 300 calorie slog is good but if you wanted to cycle or walk to work at the hospital you’d arrive hot and sweaty – not very patient friendly! There are very regular buses too but at peak times they’re full and often stuck in other traffic. There’s no room for a bus lane to improve the problem at peak times and to make it worse there’s a lot of free parking on the Venusberg which encourages people to drive up. Most of the residential streets are open for parking so if you’re thinking of doing a quick run from home to the supermarket you can guarantee you won’t get a parking place near your house when you get back. Some residents have used a relaxed planning process to put driveways in front of houses but sacrificing grass, trees and flowers for concrete isn’t cool and in some cases (our house is one) the house owners take three parking places on the street to provide two private places on a driveway which reduces parking for other residents. Obviously one of the ideas is to introduce residents parking permits. It would reduce employee traffic by a lot. It would also create problems for some employees and wouldn’t improve delivery or visitor traffic which uses on-site parking. It could, potentially, reduce traffic jams at the very peak times which would allow buses to flow more quickly and more efficiently but careful planning would need to be done. Where are these employees driving from? Siegburg, Koblenz, Meckenheim and Rheinbach are examples of places where it’s extremely time-consuming to get to Venusberg via public transport. Removing parking on Venusberg would reduce the quality of life for many workers. Even it wasn’t so slow and connection-intensive, passing through Bonn main station isn’t a nice experience and the costs of public transport is likely to be more expensive than using a car, especially if you’re ride-sharing with someone. Introducing residents parking would also leave many, many unused parking spaces during the day which might look nice but isn’t the ideal situation. E-bikes. Pedelecs can have secure routes and health benefits. I wonder how many Universitaetsklinikum (UKB) staff know that you can put a bike in the bus at Popplesdorf Platz and pay a reduced (short distance) fee to get the bike up the hill? There’s even a special bike bus that runs every 30 minutes. The multiple routes through the woods down the hill are a pleasure on a dry day. The e-bike (pedelec) is an effective solution to the hill problem. These obvious solutions don’t deserve to be held up in bureaucracy. I’m a massive fan of the e-bike solution (although not an ebike user – I’m an old-school bike fan) and that extends to mini e-cars although there’s limited potential for ecars to change to traffic situation unless dedicated routers were provided. 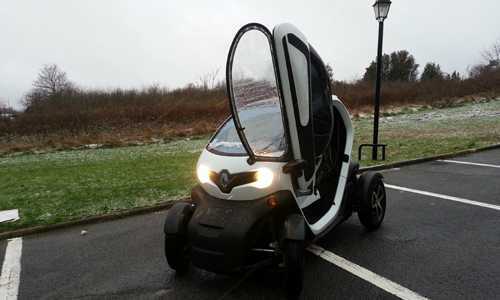 The Renault Twizy lends itself perfectly to the Venusberg traffic issue and could run near silently along at least two of the off-road bike routes. At 1.4 meters wide it’s even thin enough to run in both directions. Electric motorbikes or S-Pedelecs (high power electric bikes.) should also be considered and accepted on the bike routes up and down the Venusberg. Renualt Twizy. A 140 cm wide two-seater e-car. Via Renault. Cheaper / subsidized public transport. Job-tickets. More efficient transport route. Not over dirty, dark, overcrowded main station. Crossing Rhein is a problem if you want to avoid that. Luxury, no-stop coaches with WiFi. Small speed incentive. High comfort incentive. Better bus reliability, time information (Tip: SWB EasyGo app has real-time bus information,) facilities (WiFi) and comfort. E-buses to reduce noise. Staggered shift times at UKB / better cross-clinic shift planning to reduce crush times. UKB Ride sharing web portal / ride-share parking. Ebike rental, subsidy and ebike routes, parking and charging. Cheaper bike bus (free bike transport) / better bike bus publicity / dedicated bike bus / bike shuttle. Dedicated e-car routes / e-car hire. Twizy route. Electric mini-bus over new route combined with bike transport or public transport tickets as seen with e-ticket from VRS. An Urban Gondola for Bonn. “It’s no longer an April Fools Joke.” , Prof. Dr. Heiner Monheim. Traffic planning expert. The formal feasibility study for an urban gondola in Bonn started in February 2016 and is due to be completed at the end of 2016. It’s looking at potential gondola routes from the new UN-Campus railway station away up to Venusberg, in the other direction towards the Rheinaue and across the Rhein to the business area occupied mostly by Deutsche Telekom. It could finish up the hill in Ennert providing the first new east-west connection Bonn has had since 1972. I’ve created a map of where I understand one of the potential Venusberg routes could run. Possible route for a ‘Haribo Line’ to Venusberg. I’m excited to see this sort of transport being considered now that I understand some of the costs and some of the new technology in this transport system. At a presentation in Beuel on the 31st March I learned that 4000-5000 people per hour can be carried in each direction although that doesn’t include bikes, wheelchairs, children’s prams or cargo. Given the overhead nature of the system there’s a relatively easy planning process. Costs per km are low (15-20 million Euros) and systems can run at over 20 km/h. Recent gondola technology is able to ‘turn corners’ via mid-stations. Heating and air conditioning can be provided. Journeys are point-to-point without stops. Journey time variance is low. Reliability is high. Three-wire systems can operate in 100 km/h winds. Staff costs are low. Energy can be cleanly sourced. Noise levels are contained in end-stations. Gondola cars are removable and exchangeable which leads to interesting options for tourists and logistical transport. I, for one, would be interested in booking a Rhein-in-Flammen slow-pace gondola tour. Herr Dr. Prof. Monheim (info) industry expert and partner at Raumkom is clearly not a fan of roads and cars and therefore it’s essential to hear a pro-car view on the matter but among around 100 people at the presentation I didn’t sense much objection to the idea of a gondola. Finger-in-the-air cost projections of 150-200 million for a cross-Rhein multi-station system are indeed high but compared to a bridge, much less. It would be an exciting turn for Bonn, quite literally, in a city that is very north-south oriented in its public transport due to the river. Early plans show a potential route to the Bonner Bogen which isn’t perfect for tourists but could be developed. Have you seen the amount of evening sun over there in the summer? Avoiding the main station in Bonn City is also a potential advantage for people traveling from the east side. Gondola as the solution for Venusberg? I’m pro-gondola for Bonn but not convinced that a gondola is going to play a big part in reducing traffic running up the roads to Venusberg, especially if a gondola only runs from UN Campus to Venueberg. Consider the different types of traffic, the source points of travelers and the needs of the people taking the journeys. Many of the cars are visitors who won’t switch to public transport (they may need to make multiple journeys in a day, carry bags and carry additional family members) and many are doctors who earn enough to be able to pay for on-site parking. There are many many people that can’t switch from a car because there’s no sensible alternative, and there are lots of free street parking on the Venusberg. Despite living on the Venusberg I’m not against free parking on Venusberg because it assists staff traveling from longer distances. Remember, these workers are important members of our community too. In a Venusberg-focused study published by an expert, independent surveyor [PDF] 39 proposed changes, many from the Venusberg Anwohner Initiative, were considered and evaluated according to priority and potential. The report states that around 25% of workers at UKB come from the surrounding areas of Bonn. (About 60% of the workers come from Bonn city.) For a gondola to have traffic impact it’s got to encourage people to stop using their cars and make a complete journey via public transport. The gondola has to introduce significant time-saving and comfort aspects for that to happen. The report considers the gondola as a significantly important part of the solution. However I have questions over the figures the report uses. Page 54 or the report: “Setzt man hier auch die Obergrenze von 50% längeren Fahrzeit gegenüber dem Pkw an, käme ein Gesamtnutzerpotenzial von rund 2.700 ” Am I understanding correctly that the surveyor thinks that a 50% longer journey time is acceptable and that it will result in 2700 people taking the journey up and down via gondola? Under what conditions? A new route needs to save people time and this south-west oriented gondola won’t be perfect for many people. Again, a gondola has to introduce significant time-saving and comfort aspects for people to switch to it. A 50% additional journey time would be unacceptable for most. Remember too that a gondala won’t change the cost of a public-transport journey to UKB. I’ve read the complete document and see a useful analysis. Most points seem to be assessed well and I agree with most of the priority points. The city has agreed to take this document as a grounding for further investigation in a ‘master plan for traffic on Venusberg.’  which is a huge step forward. The (80000 Euros) analysis of the gondola concept, for example, will be completed by the end of 2016. It’s a complex calculation. The feasibility study will set out the routes taken and sources of each journey to the Venusberg and we’ll get a better picture at the end of the year. We also have to consider the touristic value of the gondola, the overall value to Bonn, the potential for new business to spring up around the gondola stations. One final thing to consider is the movement of goods up and down the Venusberg via off-peak gondolas. It’s technically possible to take passenger gondolas off the cable and to replace them with goods transport gondolas. Wouldn’t it be nice if the UKB put their goods-in station at the bottom of the hill. The chances of that huge logistical change being taken on by UKB is slim, I agree, but possible. Bonn can benefit hugely from an east-west gondola route. Not only does it have traffic-reducing potential but it has touristic value too along with the obvious ‘green’ qualities. Bonn residents could engage with the project and, if it’s a success, bring Bonn out of a history of slow development. A complete east-west route could form an important part of Venusberg traffic management. Implementation could take 3-4 years from now but there are other aspects of traffic management that could be implemented now. E-bikes seem like an obvious solution to the Venusberg hill problem and Bonn should be offering a job-ticket that offers an e-bike loan too. Venusberg could form the start of an e-bike rental system in Bonn (the rarely used bus 632 costs an estimated 150k-200k Euro per year which could be scrapped to fund the project.) In addition UKB employers should offer a subsidised e-bike leasing (full-time ownership) system with charging and servicing support. It would form part of an alternative job-ticket for Marienhospital and Venusberg staff at a slightly higher cost, but with permanent e-bike ownership included. At normal job-ticket cost it could be used to give staff a non-electric bike. I note that e-bikes can be leased for under 100 Euro per month, including servicing. It’s a great way to offer staff a healthier alternative to public transport. I’m not a transport specialist but I’ve done some heavy mathematical ‘traffic’ planning and analysis in the past. (I’ve designed and assessed internet service provider networks.) I’ve lived in London, Dublin and Amsterdam where public transport plays a big role. I’ve also lived in villages where the only transport is one’s own car or bike. I understand why people like their cars and why cars can ‘feel’ cheaper than public transport and, having not had a car for 4 years, how standing in the rain for just 5 minutes can turn you completely against the idea of public transport. I use my bike regularly and have seen health and attitude benefits. My wife runs her own Betrieblisches Gesundheit Förderung (business health facilitation) company and so I’ve learnt a little about the benefits of improving staff health. I enjoy Venusberg and after living here for so long I feel it’s time to help my local community. I write in English but you can talk to me in German. Comments are more than welcome. If you live or work on the Venusberg, please engage with the hard-working Anwohner-Initiative-Venusberg.